SPIDER-MAN: TURN OFF THE DARK... IS A THRILLING MASTERPIECE! Enjoy SPIDER-MAN: TURN OFF THE DARK. It is thrilling, brilliant theater. The entire theatrical space-- the stage from the bottom to the top & from front to back... and the space above your head up to the ceiling -- is alive with dynamic, breath-taking action. Many shows have deployed a brilliant stage picture, but none in my memory have created such spectacular, continuously engaging, constantly morphing, monumental visual images. 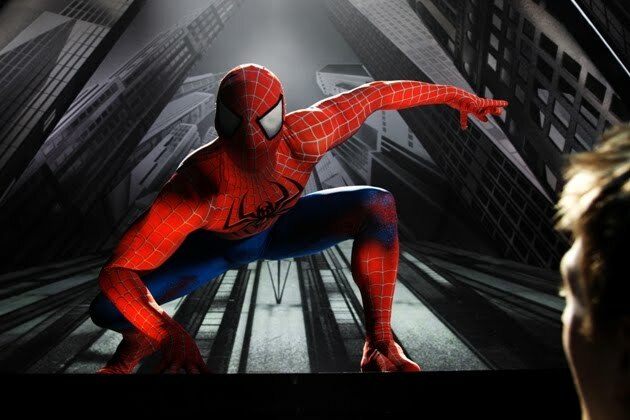 The choreography, as Spider-Man swings his way from front to back or ledge to ledge, or fights above your head, is exciting, graceful and beautiful. The stagecraft, the mise-on-scene, is epochal, constantly amazing. And FUN! 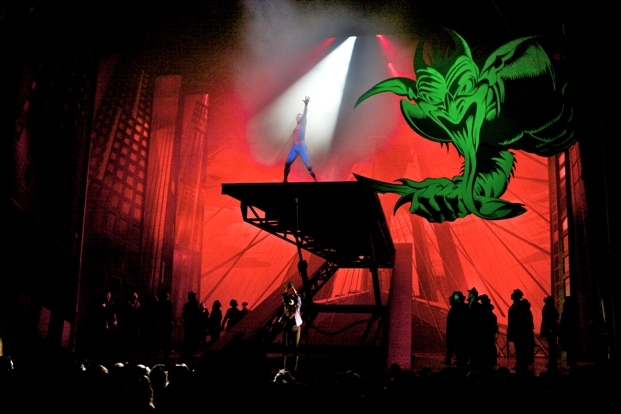 This production, built from Julie Taymor's inspiration, sets a completely new standard for theatrical presentation! Now, of course, the story is a comic book story. We are not getting Shakespearean sophistication in plotting, philosophy or poetry. But this is a comic book story: a comic book story! And it tells a coherent, fundamentally interesting, nicely resolved story that integrates perfectly with the presentation. I enjoyed the music. It is different from the style of other musicals, but just as valid and enjoyable. It insinuates itself into your memory. It has rhythm, energy, melody and passion. As a singer, Reeve Carney is not Bono, but he does well, and – for that matter -- Bono is not known for swinging through the air. Reeve, whether he is acting, singing, or swinging through the air, makes the transition from high school geek, to reluctant superhero, to successful, mature lover, convincingly and with a believable payoff at the end. It is hard for me to understand how a theater critic can be “bored” at a show this inspired. My fourth grade teacher told us that being intelligent young students we should always be able to find something interesting in whatever is happening. A theatrical experience is not just about the words, it is the entire experience: the visual splendor, the mythic story, and the musical style. These critics need to open their ears, relax their defenses, look up and let it all in! Too many great plays suffer from an audience with too few young people. The Foxwoods Theater – a very large and comfortable theater -- was filled, as it should be, with an audience of all ages. and enjoyed by all ages of theater lovers from 10 to 110. The HOBOKEN INTERNATIONAL FILM FESTIVAL was very successful. It fulfilled the promise of the Opening Night. One major objective of the festival, according to Festival Chairman Kenneth Del Vecchio, was to give developing filmmakers an opportunity to be seen and present their films. And in this it was very successful. Certainly the best part of the festival was the opportunity for filmmakers to see their films with a public audience and to network with other filmmakers. 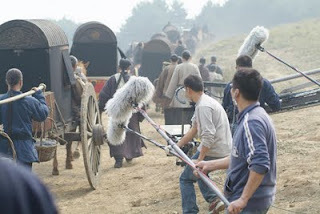 The films were well chosen, and there were opportunities given to a total of about 90 films: features, documentaries, short films, and TV pilots. And there were also five (unproduced) screenplays selected and highlighted at the festival (but not presented with a reading). The scheduling of the films and the pairing and groupings of films was outstanding. At each time slot there were two theaters showing films. And each film got a single screening. So there were about twice as many films as any one person could possibly see. By and large the audience consisted mostly of people who had a somewhat direct connection with some film in the festival. There did not seem to be very many people who were purely there as a “civilian” audience for film. Most screenings during the day on weekdays seemed to have an audience of a couple dozen. There was considerable publicity generated by and for the filmmakers on local media outlets during the festival. However, the enormous amount of publicity before and during the festival necessary to bring large numbers of civilians into the theater would have been orders of magnitude more than an independent festival could possibly manage. Probably the weakest aspect of the festival was the projection. It was not terrible: the films were all watchable and the sound was understandable. However, there were problems with both the sound and the visual images. The screenings were all at the Cedar Lane Cinema in Teaneck, NJ; the normal projection booths there are set for 35 mm film, and the screens are large. For this festival, as for many independent film festivals, the films were projected from standard DVDs or Blu-ray disks. So the festival had to provide its own projectors, and hook them into a sound system. DVD’s do not have resolution really capable of providing a perfect image – no matter what the projector – on a large screen. Blu-ray disks are obviously better. But the problems were slightly worse. The color was washed out -- desaturated -- on many films I saw; on some the aspect ratio was distorted, stretching the characters sideways; and the projector was not centered, causing additional distortion. The sound was sometimes set too loud, sometimes too soft, and sometimes muddled – sometimes changing during the screening of a single film. For most films the projection was more than adequate to understand and enjoy the story. But for some filmmakers, for whom the visual and sound presentation is an essential part of the art of the film, better quality of projection is very important. Hopefully the festival organizers will set up better projection equipment next year – and more of the filmmakers will provide Blu-ray (or even computer hosted) HD digital copies of their films. On closing night there was an awards ceremony. I was only sorry the festival did not last another day, with the nominated films getting a second screening, so I could catch up on some excellent films I missed. The awards ceremony for the winners was a rehearsal for their eventual Academy Award speeches. The only egregious error in the jury awards was that they omitted Andrew Serban's WEST SIDE GIRL, a terrific short film, from the list of nominees. It is a tense film shot on location at night with brilliant wild, natural light cinematography. The acting by the actress playing the West Side Girl, and by her low-life friends, was excellent. The story is well-written, complex and sophisticated. I am completely objective in this opinion. The fact that I have a role in the film, as the landlord being stalked by the dangerous tenant, is completely irrelevant to my opinion. At the Awards Ceremony, the Lifetime Achievement Award was presented to Carroll Baker (who celebrated her 80th birthday on May 28th)! Distinguished film critic Foster Hirsch gave a fascinating introduction to her long and distinguished career, and showed a terrific compilation of film clips from some of her most important films. The festival deserves praise for its sense of camaraderie among the filmmakers and participants, the fine parties, and the selection and presentation of a large number of indie films. It would be nice if the festival reaches out (massively) in advance to the communities near where the screenings will be, to bring in the largest possible number of neighborhood “civilians” to the audience, and share the films with the community. One possible source of publicity would be for the festival to announce the jury nominations for awards before the festival (since the jury has access to all the screeners in advance anyway). This would allow the festival to promote some “special films” and some “special actors”. It provides a great focus, so the best films do not get missed. Promoting some films especially hard probably helps all films because it draws people to the festival. Also very useful for publicity would be for the festival to provide -- to accredited journalists in advance of the festival -- production stills and cast / creative credits as well as PR contact info for all the films. The HOBOKEN INTERNATIONAL FILM FESTIVAL was very well organized and run by Festival Chairman Kenneth Del Vecchio, with dedicated and hard working Vice-Chairs, Assistants, staff and volunteers. Taking place just outside New York, the festival is convenient for New York, New Jersey and metropolitan area filmmakers; and, for out of town and international filmmakers, it is a chance to network and be seen in the New York metropolitan area. I think the HOBOKEN INTERNATIONAL FILM FESTIVAL deserves to be noticed. I think it is a great place for filmmakers to send their films. It was fun. I’m looking forward to coming back next year! Here, below (thanks to NBC) is a video of the running of the Belmont States. It was an exciting race, with RULER ON ICE (an unheralded longshot, but with top ancestry -- he's the grandson of Fusaichi Pegasus, the 2000 Kentucky Derby winner) coming in first, followed closely by the next two finishers, STAY THIRSTY and BRILLIANT SPEED. The race was decided only in the last few seconds, with Shackleford, winner of the Preakness, leading most of the race, but then fading to fifth in the final quarter mile. Animal Kingdom, the Kentucky Derby winner and Monzon bumped into each other shortly after the start of the race, nearly unseating jockey John Velazquez on Animal Kingdom, and almost dumping the horse. After horse and rider recovered, Animal Kingdom made a race for the front, but only reached sixth place. The Hoboken International Film Festival began last night with large and friendly crowds and a fine film, and continues with an enormous number of films through Thursday, June 9, all screening at the Cedar Lane Cinema in Teaneck, NJ. The Hoboken International Film Festival is organized by Kenneth Del Vecchio, a filmmaker, actor, lawyer, writer, producer, self-described 400 pound bench-presser, former judge, and current politician – he's running for the NJ State Senate on the Republican line. Opening Night had something of the flavor of a political event. 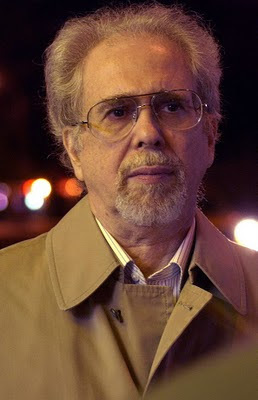 A large fraction of the audience consisted of people who had worked on the Opening Night film, THE GREAT FIGHT, which was written and produced by Del Vecchio. Much of the rest of the audience consisted of filmmakers and actors in other films to be shown later in the festival. The large theater was packed. Before the film there was a food-and-drink party. There were several interviewers outside the theater speaking on camera with the filmmakers. People came early. After the screening, people stayed late. One film that’s coming, which I can recommend, is WEST SIDE GIRL, made by Andrew Serban, screening with other short films on Tuesday, June 7 at 6:00. A devout Catholic up-and-coming female punk and lifelong resident of Manhattan's rapidly gentrifying Hell's Kitchen plots violent revenge against her landlord for evicting her in the middle of winter. I play the landlord, and I can tell you that this punk is a scary tenant. The film was shot in natural low light, with brilliant cinematography. The acting by Shannon Lower and her low-life pals is terrific. This short is a calling card for a feature length film: Andrew is just completing a script for a feature length film centered on the same character – and the same neighborhood. Two other films that seem interesting, from conversations with the filmmakers on Opening Night, are ANYWHERE, TX, screening at 4:00 PM on Wed Jun 8 and ALL GOD’S CHILDREN, screening at 2:00 PM Saturday. Kenneth Del Vecchio’s film, THE GREAT FIGHT, directed by Sherri Kauk is very good. It is the story of an autistic savant, of high school age, who has special, extraordinary intuitive skills as a fighter. He is taken under the tutelage of a policeman who once was an MMA upcoming fighter, and now owns an MMA school. MMA = Mixed Martial Arts, and is a brutal kind of fighting in which kicking, wrestling and punching are all allowed, and the boundary is not a flexible rope, but a steel cage. The story takes place in a small town in new Jersey and, appropriately, the characters speak in New Jersey voices, not with Hollywood diction, look like New Jersey people, not like Hollywood actors, and some scenes take place in and around New Jersey courtrooms that do not look like Hollywood courts, involving New Jersey judges and policemen that have an authenticity that is not made in Hollywood. Frank Giglio -- who is not a professional actor, but rather a policeman and martial arts instructor, and is, in fact, the inspiration for elements of the story – plays a policeman and martial arts instructor. He is natural and interesting in front of the camera, and makes a powerful presence. Miguel Jarquin-Moreland, who plays the autistic young man, is really terrific; he is someone to watch. While the ambiance and acting are excellent, the film’s love story is a bit timid, as is the way it shows MMA fights, which – as shown on television – are much more physical and bloody than the fights shown here. The writer, Del Vecchio (a former prosecutor and judge, and currently a politician -- he's running for the NJ State Senate on the Republican line -- as well as filmmaker), seems to be wearing his heart on his pencil: he does not like prosecutors who overstep the law, and does like cops who act with compassion and understanding. He also seems to like the violence of MMA. He is sensitive to (non-English speaking) characters who seem to be criminal, but are in fact victims who need help. The writing is simple and straightforward, though it’s a little too simplistic in a plot-line involving the prosecutor. The dialog is natural and authentic. And the screenplay avoids the usual clichés in films about a developing love, or the buildup to a “great fight”. So I liked the way it ends. EMPIRE OF SILVER is a visual treat and a narrative mess. The story is really very interesting, though as told in the film it is nearly incomprehensible at first viewing. Because the story is interesting, and watching the film actually a pleasure, describing the plot/story explicitly is not a SPOILER but something of a RESCUER. The hardest part of understanding the film is figuring out who's who, and what their relations are... but before that, some background. First of all, the film takes place from about 1898 through the first decade of so of the 1900's. 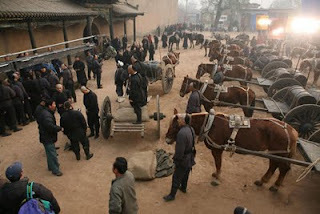 The focus of the film is a family which runs a chain of major banks in North-Western China. The main currency at the beginning of this period is silver (not gold, as in the US). Then, paper money backed by silver becomes the currency. But when the government is weak, paper money becomes of dubious value, and hard currency (ie silver) becomes essential. A principal function of the bank is to maintain physical stores of silver and provide/transport them whenever and wherever needed. Secondly, during this period there are several upheavals: From 1898 to 1900 an anti-missionary, anti-foreign rebellion began in Northern China and spread to Peking (Beijing). Many missionaries and foreigners were killed. An army of Western Nations including British and French suppressed the rebellion. Because of the hand-to-hand fighting methods and training of the rebels, the Western Press called them "boxers" and this was known as the "Boxer Rebellion." The Ch'ing (or Qing) Dynasty, which had ruled for 250 years, supported the Boxers, and when the rebellion was suppressed, the dynasty was weakened and led to a Chinese Republic a decade or so later. Before, during and after the Boxer Rebellion, China was buffeted by fighting between warlords, conservative nationalists (eg the Boxers), and progressive modernizers. There was a great difference between the poverty of most people, especially peasants, and the wealth of the ruling and merchant classes. The story takes place largely in Shangxi, Beijing, Tianjin, and the Gobi Desert. Shangxi is near the coast of China roughly parallel to Southern Japan. Beijing is East of Shangxi, inland; Tianjin is South of both cities, roughly making an equilateral triangle, and the Gobi Desert is East and North of Beijing, extending to East and North of Shangxi. The story begins with the head of the family, Lord Kang, and his four sons. The First Son is a deaf mute, the second an impetuous fighter, the third a sensitive young man. The Fourth Son is married to a beautiful woman who is is kidnapped and raped on a journey. She dies, but the Second Son is killed in a fall during a rescue attempt, and the Fourth Son goes mad with grief. That leaves the Third Son, also called Third Master, to take up the family business. Third Master and Lord Kang (his father) differ on the ways the bank should operate, and whom the bank should hire as its principal operating officers. The film, with beautiful cinematography, and compellingly attractive and interesting actors and characters, describes the sweep of life -- as well as the personal values and relationships -- in China over this period of transition (the early 1900's) as seen through the eyes of this family trying to sustain their bank, as politics, war, and economic principles keep changing around them. EMPIRE OF SILVER is directed by a noted stage director, Christina Yao, making her first major film, and stars Aaron Kwok and Hao Lei, both extremely attractive and charismatic.